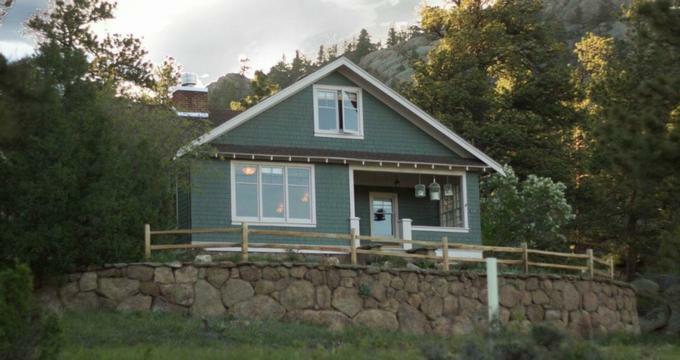 Set on five acres of beautiful grounds in the majestic Colorado Rocky Mountains, the Golden Leaf Inn is a boutique bed and breakfast that offers an exceptional Estes Park lodging experience. Built in 1922 in a historic arts and crafts style, the picturesque mountain Inn has been lovingly restored to its former glory to provide luxurious accommodations and award-winning amenities. The Inn boasts five exquisitely appointed guest rooms with breathtaking mountain views, en-suite or shared bathrooms with deep soaking tubs and walk-in showers, custom furnishings, and modern amenities. A sumptuous breakfast is served every morning in the elegant dining room, and the Inn features several comfortable common areas where guests can relax such as a fully stocked library, an inviting living room with a wood-burning fireplace and a piano, outdoor patios with a hot tub, and a basement screening room. Tucked away in a quiet locale, the Golden Leaf Inn is within walking distance to the delightful Estes Park Main Street and a short drive to Rocky Mountain National Park. The Golden Leaf Inn features five beautifully appointed and individually decorated guest rooms with sumptuous décor and furnishings, private bathrooms and modern conveniences. All rooms have king or queen-size pillow-top beds with deluxe linens, hypoallergenic pillows and down duvets, and en-suite or shared bathrooms with double vanities, antique claw-foot bathtub, walk-in showers, thick towels and plush bathrobes, and organic toiletries. Airy sitting areas have comfortable armchairs, writing desks and chairs, electric fireplaces, and stunning garden views. The Heavenly Room is the master bedroom and features a king-size sleigh bed with deluxe linens, and an en-suite bathroom with an antique claw-foot bathtub, walk-in shower, double vanities, plush bathrobes and towels, and organic bath products. Exuding quaint splendor on the second floor, the Heavenly Room also has a Stickley writing desk and armchair, an electric fireplace, and ample closet space. Located on the second floor and epitomizing rustic mountain chic, the Rustic Royal Room is decorated in knotty pine wood finishes take from the original 1922 home. The room features a king-size bed with deluxe linens, and an en-suite bathroom with deep soaking tub and shower, plush bathrobes and towels, and organic bath products. Decorated in warm hues, the delightful room also has two vignette sitting areas with comfortable seating and lovely garden views. The Romantic Rose Room is set on the first floor and is a tribute to the Victorian Era with a rod-iron queen-size bed dressed in deluxe linens and a pillow-top mattress, and a private hallway bathroom with deep soaking tub and shower, plush bathrobes and towels, and organic bath products. The room also features a settee and a writing desk. Located on the first floor, the Long View Room boasts beautiful views over downtown Estes Park and features original 1922 lighting fixtures, a queen-size bed dressed in deluxe linens and a pillow-top mattress, and a private hallway bathroom with deep soaking tub and shower, plush bathrobes and towels, and organic bath products. The Creative Copper Room can be found on the first floor and features two French doors that open onto gorgeous mountain views. The bright and airy bedroom is equipped with a king-sized bed dressed in deluxe linens and a pillow-top mattress, a private bathroom with a jetted tub and walk-in shower, plush bathrobes and towels, and organic bath products. The room has two oversized chairs and a beautiful copper inset ceiling that gives the room a warm and welcoming ambiance. A hearty continental breakfast is served in the dining room every morning and includes fresh fruit juice and fruit, hot and cold cereals, yogurt, freshly baked bread and pastries, egg and meat dishes and signature treats, along with coffee, tea, and other hot beverages. Deluxe amenities at the Golden Leaf Inn include three outdoor patios and a relaxing hot tub with beautiful mountain views, a fully stocked library and lounge with plush armchairs and sofas, an inviting living room with a wood-burning fireplace and a piano, and a basement screening room for movie nights. A sumptuous breakfast is served every morning in the elegant dining room, and the Inn offers an array of outdoor and recreational activities year-round, ranging from hiking, mountain biking, and fishing in the summer months to snowshoeing, ice climbing, and cross-country skiing in the winter. Estes Park offers a variety of activities and attractions throughout the year, from shopping and dining out to visiting galleries, museums, state parks, and historic sites.